Nutiva Coconut Manna Unrefined 15 oz. 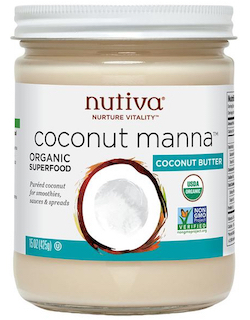 Nutiva Coconut Manna 15 oz. An incredibly tasty, whole superfood made of pure, dried coconut flesh. Enjoy it straight from the jar or warm it up to spread the goodness! This tropical melt-in-your-mouth treat contains fiber, protein and nourishing fats. An ideal "everything" spread that can replace cream, cream cheese and butter. It can also be added to smoothies, sauces, dressings, desserts and baked goods. To liquify, place jar in hot water for 2 minutes and stir. Note: the red or brown specks are characteristic of natural coconut products. Ingredients: Organic creamy whole coconut: Coconut Manna is a delicious whole food, made of pure, dried coconut flesh. This tropical "melts in your mouth" treat contains 12% fiber plus 9% protein and nourishing fats.